Grains Gill is the name of the valley that Grains Gill Beck runs through. Carpholite and several other species supposedly collected here in the 1950s and 1960s by Arthur Kingsbury (1906-1968) are now considered unlikely. This is one of a number of likely or definitely falsified Kingsbury localities. Note: Kingsbury and Hartley occasionally refer to the Carrock mine site as "Grainsgill" (Cooper & Stanley, 1990). Habit: minute crystals and compact patches in quartz stringers in the greisen. Reference: Kingsbury, A.W.G. and Hartley, J. (1956) Cosalite and other lead sulpho-salts at Grainsgill, Carrock Fell, Caldbeck, Cumberland. Mineralogical Magazine, vol. 31, n° 235, 296-300. Reference: Kitchen, C.S. (1934) The Skiddaw Granite and its residual products. Quarterly Journal of the Geological Society, 90(1-4), 158-200.; Cooper, M.P. and Stanley, C.J. (1990) Minerals of the English Lake District: Caldbeck Fells. Natural History Museum Publications, London, 160 pp. Description: Kingsbury reference to a ferrian variety. Kingsbury & Hartley (1958): "pale yellowish-buff, fine-grained, earthy, ferriferous." Reference: Kingsbury, A.W.G. and Hartley, J. (1958) Jarosite and natrojarosite from the Lake District. Mineralogical Magazine, 31(240), 813-815.; Cooper, M.P. and Stanley, C.J. (1990) Minerals of the English Lake District: Caldbeck Fells. Natural History Museum Publications, London, 160 pp. (referring to Kingsbury & Hartley, 1958). Reference: Kingsbury, A.W.G. and Hartley, J. (1956) New occurrences of vanadium minerals (mottramite, descloizite, and vanadinite) in the Caldbeck area of Cumberland. Mineralogical Magazine, vol. 31, n° 235, 289-295. Reference: Hitchen, C.S. (1934) The Skiddaw granite and its residual products. Quarterly Journal of the Geological Society of London, 90, 158-200.; Eastwood, T., Hollingworth, S.E., Rose, W.C.C., and Trotter, F.M. (1968) Geology of the country around Cockermouth and Caldbeck. Memoirs of the Geological Survey of Great Britain. ; Cooper, M.P. and Stanley, C.J. (1990) Minerals of the English Lake District: Caldbeck Fells. Natural History Museum Publications, London, 160 pp. (referring to Eastwood et al., 1968). Description: Kingsbury reference. Kingsbury and Hartley (1957): "drusy, slightly botryoidal aggregates of minute, brown, glistening scales coating quartz and arsenopyrite." Reference: Kingsbury, A.W.G., and Hartley, J. (1957) New occurrences of arseniosiderite. Mineralogical Magazine, vol. 31, n° 237, 499-500. Reference: Kitchen, C. S. (1934). The Skiddaw Granite and its residual products. Quarterly Journal of the Geological Society, 90(1-4), 158-200. Description: Kingsbury reference. Kingsbury and Hartley (1960): brown, powdery aggregates in gossany material from near the intersection of an east-west 'lead-vein' with the north-south Emerson vein of the 'granitic' suite." Reference: Kingsbury, A.W.G. and Hartley, J. (1956) Cosalite and other lead sulpho-salts at Grainsgill, Carrock Fell, Caldbeck, Cumberland. Mineralogical Magazine, vol. 31, n° 235, pp. 296-300. Habit: minute acicular crystals or fibres, tufts or wool-like aggregates, or small fibrous patches. Description: Kingsbury reference. Kingsbury & Hartley (1957): "thin, fibrous-radiating aggregates in joints in white vein-quartz, specimens collected being derived almost certainly from the Emerson vein of the Carrock Wolfram Mine. In contrast to its more usual deep straw- or wax-yellow colour, the Grains Gill mineral is of a pale, almost cream yellow, and until the quartz is broken appears merely as a faint yellowish staining." Habit: minute tufts, rarely exceeding 3-4 mm., of capillary fibres; single fibres up to 1 1/2 cm; small compact fibrous patches. Colour: steel grey; very dark grey, often showing a bluish or yellowish tarnish. Reference: Rastall, R.H. (1910) The Skiddaw granite and its metamorphism. Quarterly Journal of the Geological Society of London, 66, 116-141.; Rastall, R.H. and Wilcockson, W.H. (1915) The accessory minerals of the granitic rocks of the English Lake District. Quarterly Journal of the Geological Society of London, 71, 592-622.; Hitchen, C.S. (1934) The Skiddaw Granite and its residual products. Quarterly Journal of the Geological Society, 90(1-4), 158-200.; Firman, R.J. (1978) Epigenetic mineralization in the Lake District, pp. 226-241 in Moseley (Ed.) (1978). ; Cooper, M.P. and Stanley, C.J. (1990) Minerals of the English Lake District: Caldbeck Fells. Natural History Museum Publications, London, 160 pp. (referring to Rastall, 1910, Rastall & Wilcockson, 1915, and Firman, 1978). Reference: Kingsbury, A.W.G. and Hartley, J. (1960) Carminite and beudantite from the northern part of the Lake District and from Cornwall. Mineralogical Magazine, vol. 32, n° 249, 423-432.; Cooper, M.P. and Stanley, C.J. (1990) Minerals of the English Lake District: Caldbeck Fells. Natural History Museum Publications, London, 160 pp. Reference: Kingsbury, A.W.G. and Hartley, J. (1956) New occurrences of vanadium minerals (mottramite, descloizite, and vanadinite) in the Caldbeck area of Cumberland. Mineralogical Magazine, 31(235), 289-295.; Kingsbury, A.W.G. and Hartley, J. (1956) Cosalite and other lead sulpho-salts at Grainsgill, Carrock Fell, Caldbeck, Cumberland. Mineralogical Magazine, 31(235), 296-300.; Cooper, M.P. and Stanley, C.J. (1990) Minerals of the English Lake District: Caldbeck Fells. Natural History Museum Publications, London, 160 pp. Description: Kingsbury reference. Kingsbury & Hartley (1958): "crusts of very small golden-yellow to brown crystals on white vein-quartz from the 'granitic' suite of veins; it is associated with pale yellowish-buff, fine-grained, earthy ferriferous alunite (B.M. 1956, 76; 1958, 43)." 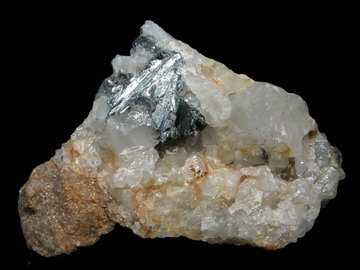 Reference: Fortey, N.J. (1978) Mineral parageneses of the Harding vein tungsten deposit, Carrock Fell mine, Cumbria. Mineralogy Unit Report n° 228, Institute of Geological Sciences. ; Roberts, D.E. (1983) Metasomatism and the formation of greisen in Grainsgill, Cumbria, England. Geological Journal, 18, 43-52.; Cooper, M.P. and Stanley, C.J. (1990) Minerals of the English Lake District: Caldbeck Fells. Natural History Museum Publications, London, 160 pp. (referring to Fortey, 1978 and Roberts, 1983). Reference: Kingsbury, A.W.G. and Hartley, J. (1955) On the occurrence of the rare copper molybdate, lindgrenite, at Brandy Gill, Carrock Fell, Cumberland. Mineralogical Magazine, 30(230), 723-726 (referring to molybdenite, scheelite and wolframite "in and near Grainsgill"). Reference: Kingsbury, A.W.G., Hartley, J. (1957) New occurrences of arseniosiderite. Mineralogical Magazine, vol. 31, n° 237, 499-500. Habit: stout hexagonal prisms with basal planes. Colour: pale buff to whitish and almost colourless. Reference: Kingsbury, A.W.G. and Hartley, J. (1955) On the occurrence of the rare copper molybdate, lindgrenite, at Brandy Gill, Carrock Fell, Cumberland. Mineralogical Magazine, 30(230), 723-726 (referring to molybdenite, scheelite and wolframite "in and near Grainsgill"). ; Kingsbury, A.W.G. and Hartley, J. (1957) Carpholite from Cumberland and Cornwall. Mineralogical Magazine, vol. 31, n° 237, 502. Reference: Kingsbury, A.W.G. and Hartley, J. (1956) Cosalite and other lead sulpho-salts at Grainsgill, Carrock Fell, Caldbeck, Cumberland. Mineralogical Magazine, vol. 31, n° 235, 296-300.; Anthony, Bideaux, Bladh, Nichols (1990) Handbook of Mineralogy, vol. 1 (http://www.handbookofmineralogy.org/pdfs/zinkenite.pdf states the occurrence of zinkenite at Carrock Fell, but not specifically from Grainsgill). Lysons, D. and Lysons, S. (1816) Magna Brittania; being a concise topographical account of the several counties of Great Britain. Vol. 4 Cumberland. Cadell and Davies, London, 200 pp. ["beryl from "Caldew Beck"" is probably "apatite from Grainsgill" - Cooper & Stanley, 1990]. Rastall, R.H. (1910) The Skiddaw granite and its metamorphism. Quarterly Journal of the Geological Society of London, 66, 116-141. Rastall, R.H. and Wilcockson, W.H. (1915) The accessory minerals of the granitic rocks of the English Lake District. Quarterly Journal of the Geological Society of London, 71, 592-622. Kingsbury, A.W.G. and Hartley, J. (1955) On the occurrence of the rare copper molybdate, lindgrenite, at Brandy Gill, Carrock Fell, Cumberland. Mineralogical Magazine, 30(230), 723-726 (referring to molybdenite, scheelite, and wolframite "in and near Grainsgill", possibly meaning the Carrock mine). Kingsbury, A.W.G. and Hartley, J. (1956) Cosalite and other lead sulpho-salts at Grainsgill, Carrock Fell, Caldbeck, Cumberland. Mineralogical Magazine, 31(235), 296-300. Kingsbury, A.W.G. and Hartley, J. (1957) New occurrences of arseniosiderite. Mineralogical Magazine, 31(237), 499-500. Kingsbury, A.W.G. and Hartley, J. (1960) Carminite and beudantite from the northern part of the Lake District and from Cornwall. Mineralogical Magazine, 32(249), 423-432. Dawson, J. and Harrison, R.K. (1966) Uraninite in the Greinsgill greisen, Cumberland. Bulletin of the Geological Survey of Great Britain, 25, 91. Firman, R.J. (1978) Epigenetic mineralization in the Lake District, pp. 226-241 in Moseley (Ed.) (1978). Moseley, F. (Ed.) (1978) The geology of the Lake District. Yorkshire Geological Society. Occasional Publication No. 3. viv, 284 pp. Roberts, D.E. (1983) Metasomatism and the formation of greisen in Grainsgill, Cumbria, England. Geological Journal, 18, 43-52. Ryback, G., Hart, A.D., and Stanley, C.J. (2001) A.W.G. Kingsbury's specimens of British minerals. 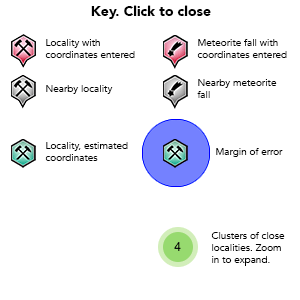 Part 1: some examples of falsified localities. Journal of the Russell Society, 7(2).